De Beer made his Springbok debut against the British & Irish Lions in 1997, playing in the dead rubber third Test victory over the tourists in place of Henry Honiball. His most famous moment in international rugby came in the quarter-final of the 1999 Rugby World Cup, when he slotted a record five drop-goals to beat England in Paris. In 1997 he also notched a South African record, scoring 46 points for Free State in a Currie Cup victory over Northern Free State. 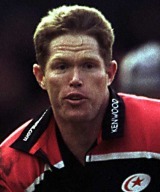 He retired in 2002 due to a knee injury, having enjoyed a spell in England with Saracens.